As a non-Indigenous teacher who teaches First Nations, Metis and Inuit (FNMI) Studies at the high school level, I am often posed with a few questions: Why FNMI Studies? How did you get into that field? Are you even allowed to teach that subject since you are not Indigenous? These questions always seemed curious to me, as I never believed my passion to teach FNMI Studies was out of the ordinary. The path that lead me to this vocation is one of holistic growth, and I am always happy to share it with those who ask. When I started my studies at Queen’s University, I aimed to finish with an undergraduate degree in History and to one day become a high school teacher. I always understood history as a story, and was excited about the prospect of sharing meaningful stories with future generations. I took a particular interest in the story of Indigenous peoples in Canada—a story of resilience and strength. To some degree, I identified with the colonial oppression that confronted Indigenous peoples. With brown skin and jet black hair, I developed early conceptions of what it meant to be a person of colour, the ramifications of existing as a visible minority, and the obstacles that came with it. Throughout my studies I was exposed to the rich and distinct cultures of Indigenous peoples, as well as the tough realities that confront Indigenous peoples today. I was fortunate to meet some amazing Indigenous professors, community leaders, and colleagues; each of whom impacted my perspective and understanding of Indigeneity in a meaningful way. The word gets thrown around loosely. I needed to be sure that it was the right word to describe myself, and better yet, as I learned, that Indigenous People in my life could and would use. I knew that I cared – yet learned that caring was not enough. I knew that I had the tools to make a change. I also learned that caring and tools weren’t enough. This lead to me to genuinely know that I could significantly contribute to sharing truths about Indigenous history, strengths and knowledge in my role as a teacher, as long as I kept listening and learning myself. The next steps were to put words into action. In May 2018, I was admitted to the Queen’s Faculty of Education as a Teacher Candidate, with qualifications to teach History and FNMI Studies. I was welcomed into the Aboriginal Teacher Education Program (ATEP) to deepen my understanding of how to decolonize and re-indigenizing education. As a non-Indigenous Teacher Candidate, it has been an honour and privilege to be welcomed into the ATEP program. I connected with Three Things Consulting to get involved with the amazing projects and initiatives they pursue. This organization’s work focuses on social innovation through the engagement of youth and young adults, instilling Three Things in the next generation: You matter. You are important. You belong. These three values promote holistic growth, wherein youth can succeed through self-discovered agency. The Three Things will act as the cornerstone of my pedagogy moving forward. I am excited to learn and grow with Pytor and their team of consultants across the country. As a non-Indigenous instructor teaching FNMI Studies, I understand that some cultural traditions and concepts need to be taught by Indigenous community leaders. I advocate for authentic learning and aim to work in cohesion with Indigenous Peoples in the classroom; who become an invaluable resource and truthtellers; sharing what I cannot. My role as a teacher will be to support students physically, mentally, emotionally, and spiritually. My holistic approach to teaching aims to tell a story in which non-Indigenous students see themselves as potential allies that have the agency to make a difference. My pedagogy also focuses on co-constructing a safe environment for Indigenous students to re-write the narrative of Indigeneity in Canada through a holistic and creative curriculum. Though this may seem like a challenging and idealistic task to some, it is what students deserve; it is what our education system needs. While students comprise just over 20% of our population, they make up 100% of our future. No matter what subject I teach, every student will leave my class knowing Three Things: You matter. You are important. You belong. By encouraging students to realize their worth and potential, we create opportunities for meaningful social innovation. My personal goal is have them leave with one more belief: You are the author of your own story. 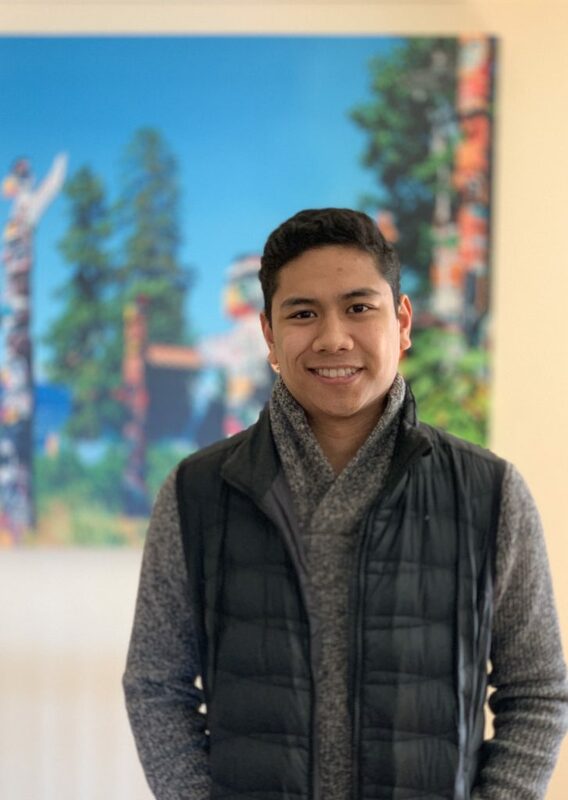 With a degree in Global Development Studies from Queen’s University, Joey Ozamiz is a student at The Aboriginal Teacher Education Program in Queens University Faculty of Education, preparing to graduate this summer. A first generation Canadian, Joey’s family comes from Manila, Philippines. Growing up in Mississauga, Joey was conscious and aware of racial inequities in Canada and the lack of information he gained in a mainstream school system about the Indigenous Peoples who were on this land prior to Canada being formed. Joey believes that meaningful truth and reconciliation begins with authentic education and recognizes that we are still in the beginning stages of deconstructing the truths of Indigenous history in Canada. Joey wants to educate young people on the historical and contemporary issues that confront First Nations, Metis and Inuit peoples and hopes to encourage the next generation to become civically engaged within their communities. Joey’s personal and professional experience has led him to intern with Three Things Consulting. During his time here, Joey will contribute to the ongoing process of deconstructing colonial education and re-indigenizing the classroom through holistic teaching strategies.